Types of Art: Diomande art includes wooden sculpture and masks, which are danced for initiation, education, and entertainment. History: Although there are few sources available on Diomande culture, much has been written about Dan peoples who live to the south of Diomande territory and share many cultural and artistic similarities. Oral traditions describe Diomande society of the 19th century as lacking any central governing power. Social cohesion was fostered by a shared language and a preference for intermarriage. Generally, each village had a headman who had earned his position of advantage in the community through hard work in the fields and luck as a hunter. 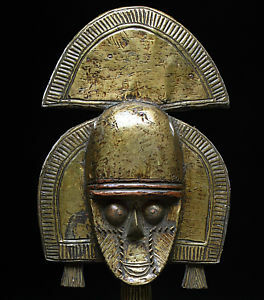 These headmen usually surrounded themselves with young warriors for protection from invading neighbors, and exchanged gifts with other chiefs in order to heighten their own prestige. Economy: Young people strive to make a name for themselves by lavishly spending at community feasts to demonstrate their wealth. Rice, yams, taro, manioc, maize, and bananas are the primary crops grown. Although farming and hunting have been largely replaced by laboring in the diamond camps or working at the rubber plantations, the establishment of a hierarchical social order is still based on the individual's ability to succeed. Political Systems: Diomande political systems consisted largely of non-centralized, fragmentary political groups, in which decisions are made on behalf of the community by councils of elder men. Masking often served as a means of social control, enforcing the rules established by the elders. Diomande initiation is not tied to Poro societies, as is the case of their many neighbors, but masks do appear at initiation. Performances also occur during funerals and for purposes of entertainment. Although described primarily as entertainment, such performances also contain social and political commentary that serve to demonstrate to the community the wisdom of the elders. Religion: The Diomande world view holds that everything can be divided into two separate and clear categories. The primary dichotomy is between village and bush, in other words, things that have been controlled by man and things that have not. Crossing over the dividing line is dangerous business, and whenever it is done, whether to clear new fields or simply crossing the forest, the bush spirits must be appeased. In order to take part in village life, the bush spirits must take corporeal form. The Diomande believe that all creatures have a spirit soul (du), which is imparted onto humans and animals from the creator god (Xra) through birth. One's du is immortal and is passed on after death to a new being. However, some du remain bodiless. They inhabit the forests as bush spirits and must establish a relationship with a person if they wish to be manifested and honored. Often the spirit will request the chosen person to dance the spirit, utilizing a mask to illustrate the spirit's embodiment.